All-New Food Safe ImPRESSive Re-usable Molding Putty changes the way you create unique molds and casts from your favorite edible treats. Uses all food safe ingredients and can handle temperatures up to 200 F.
Just take your keys, your jewelry, your doll’s head, your toys, and PRESS. Then duplicate your part in chocolate, fondant, sugar candy, cheese, butter, cookie dough, and more. 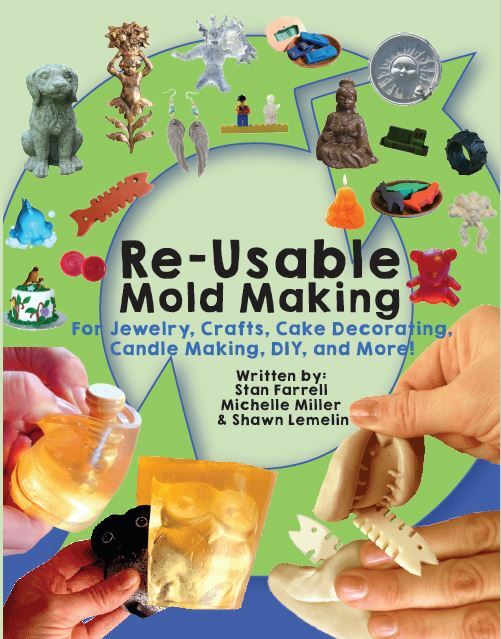 Make custom cakes, cookies, and chocolates with a simple molding material. Also, instantly make new molds just by re-melting in your microwave. ImPRESSive Putty can be re-melted and re-used as many times as you want and used with tons of different edible sweet treats. The simplest molding material ever made. Unique combination of materials and processing enable crisp, highly detailed molds, and ability to make complex shapes through 2-part molds and push molding. With advances in production and materials, ImPRESSive Putty works with you. The material can be re-melted and re-used any time you want. Just Press over your phone, your wall, your camera, your children’s toys, your wedding ring, your wedding dress lace, your hand, and more. ImPRESSive Putty is able to mold what you want and as you make molds, you can continuously re-melt and re-use the ImPRESSive Putty to make your ideas real like a Star Wars Figurine, Shopkins Toy, all into edible treats. Please support the cause: https://www.kickstarter.com/projects/composimold/food-safe-eco-friendly-re-usable-mold-making-putty Kickstarter ends October 11, 2017. Re-use as many times as you want. Clean with a cold wet wash cloth or running cold water. Keep the mold or soften in the microwave to make a new mold any time you want.